Apparently everyone in the blogesphere is getting a forumspring so if you want to ask me any questions you can here. The concept is you can ask anonymous questions so if you have questions about me, please go ahead. I had one linked up to my facebook a while back, I didn’t use it too much. Go figure the name is still lolzthatswim. I didn’t actually realize so many of my blogging bffs were vegetarian. That is really cool and I’m supportive of each and everyone of you. If anyone would like to write a guest post about what led them to the decision please feel free to email me lolzthatswim@gmail.com. Today was not a real girl day by any means. It was pouring rain and thunder storming and even making it across campus to class would be a journey for this girl. 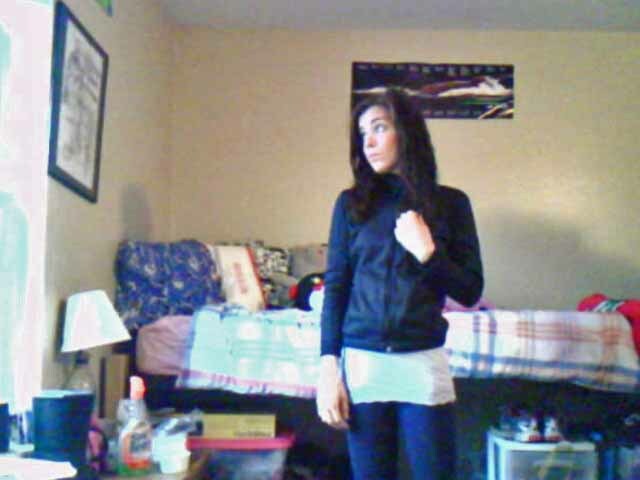 I sported my favorite nike sports jacket that I got last summer for my birthday along with a long cami and forever 21 leggings. Ya know people holler at girls that look like this especially since it was humid so there was no point in even trying to groom my hair…. Last night around 3am it thunder stormed for the rest of the night and until about 7am. I hate thunderstorms. HATE THEM. Me and the penguins cuddled all night last night hoping the storm would pass. I really hide under my covers and have all the big pillows over my head. So as if my day wasn’t already pretty easy-I found this note on the door of coaching class today. 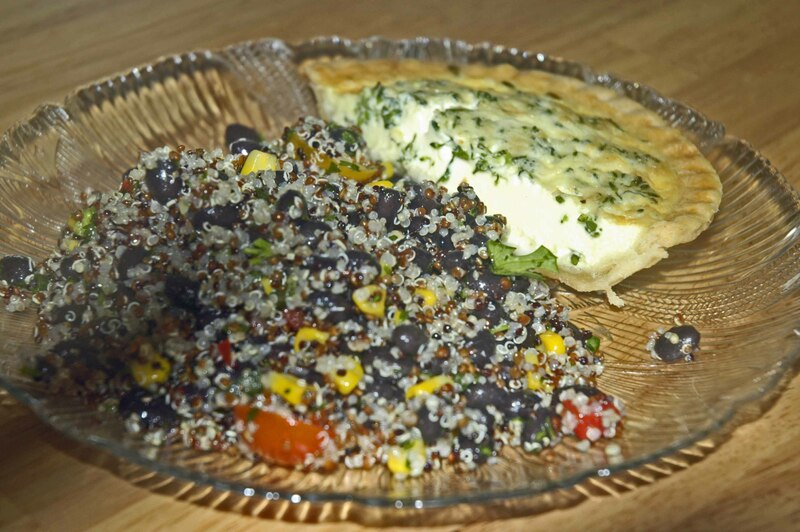 Lunch was a quiche today and spicy black bean quinoa salad. The spicy black bean quinoa salad also had corn, tomatoes and some other random vegetables. I’m not going to lie-my campus food is the bomb.com and has plenty of vegan/vegetarian options. My favorite little café, Dexter’s, is where I will continue to get my quiches. For dinner tonight, I used my expert cooking skills. I have a confession to make-I’m not really a foodie and like recipes that take about 5 minutes to make. I’m a busy college student and between homework and such, I like healthy food that is rather quick to make. Tonight’s dinner was no exception, I grilled a crab cake and added garlic, sautéed some vegetables (with more garlic and onion powder) and cooked a sweet potato. I always top my sweet potatoes with cinnamon and Greek yogurt. If you have never tried it-it’s pure bliss. I think dinner tonight took me about 10 minutes to make and 1 to eat. 1. Do you make food that take a while to cook or do you like speedster recipes? 2. Do you like your campus food? Does it have somewhat healthy choices? 3. Do you like thunderstorms? I LOVE to cook! Takes me about 30 minutes each night. I like making foods that take a long time to cook- they always seem to taste better! I’m not in college yet, but I’m hoping my campus has tasty food! I love thunderstorms. We have a crazy monsoon season here in AZ during late summer. I despise making food and putting stuff together so I like when it’s a bunch of things I can just eat as-is. Yay you were in the pool today! You go girllll!!! I really like thunderstorms, just not when I have to walk through the rain & storm to get to class. It was storming in the morning, then the humidity kicked in and my hair went crazy. My campus food is great and very vegetarian/vegan friendly. My favorite day is Thursday because it’s falafel wrap day on campus! Eeek I can’t stand thunderstorms! Lightning frightens me. I really enjoy intense recipes that require a lot of work, but more often than not I’m using quick recipes because of my schedule. I use a lot more involved recipes during the summer when I actually have time. I wish I could get quiches everyday. School cafeteria food = nast. College food=meh. It’s kinda hit or miss for me, I like cooking much better! I am a speedster cook for sure. I honestly hate calling any of my food “recipes” since it is just throwing a few things together and calling it a meal. Thunderstorms — no thanks. Rain? yes please. I sleep so well when it rains! I like thunderstorms. Sometimes they make the sky look all spooky and cool. My mom cooks for me. Hahah. I had fish tonight, again. Then, luckily at my school, I can go off campus for lunch. I usually bring my own lunch though. 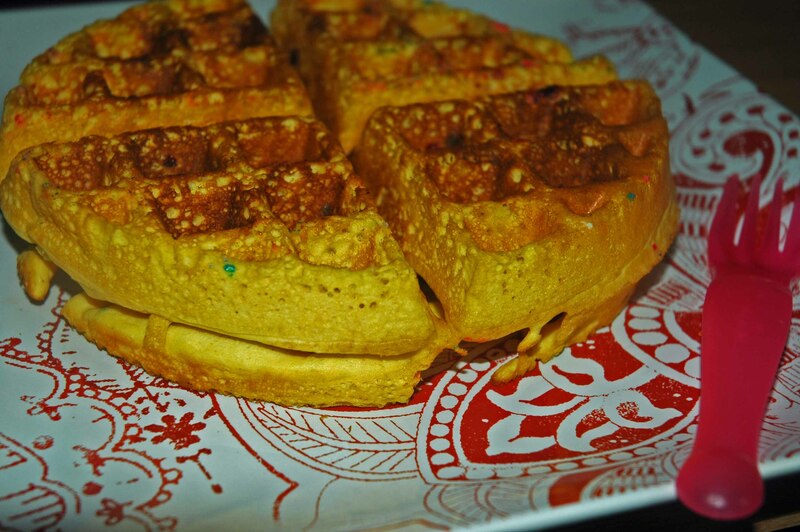 My campus had crappy food- everything you show that you ate at school looks super yummy! We hardly had anything for vegetarians except the ubiquitous salad bar! Even a piece of fresh fruit was hard to come by some days, bleh. Thunderstorms are awesome for sleeping but well… that’s about it. Your campus food does look good. And I love Tstorms. The crazier the better! 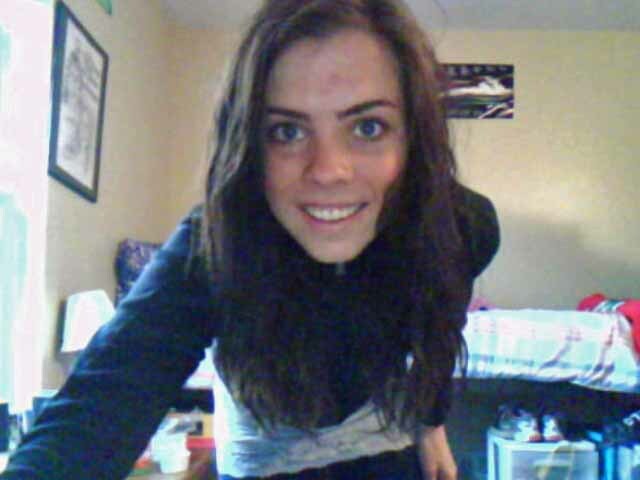 And your “non real girl day” looks a lot better than mine! i LOVE thunderstorms- but not when i need to get out in them! only when i can stay in my pjs ALL day! I cook as fast as I can, but that doesn’t mean its fast- feel me? I like to get it in the oven, grab a shower, then be ready when the food is done. I am totally trying your sweet potato recipe/idea tomorrow! Perhaps with some peanut butter too. Did you make the crab cake yourself? AH! I hate thunderstorms too! They always make me jump when I’m laying in bed! My campus had lots of great choices for food, too! We were so lucky! How awesome that your campus has such healthy food choices! I am definitely not a foodie either…all my meals take ten minutes tops to make. I was a walking afro yesterday! I hate the humidity!!! mmmm! 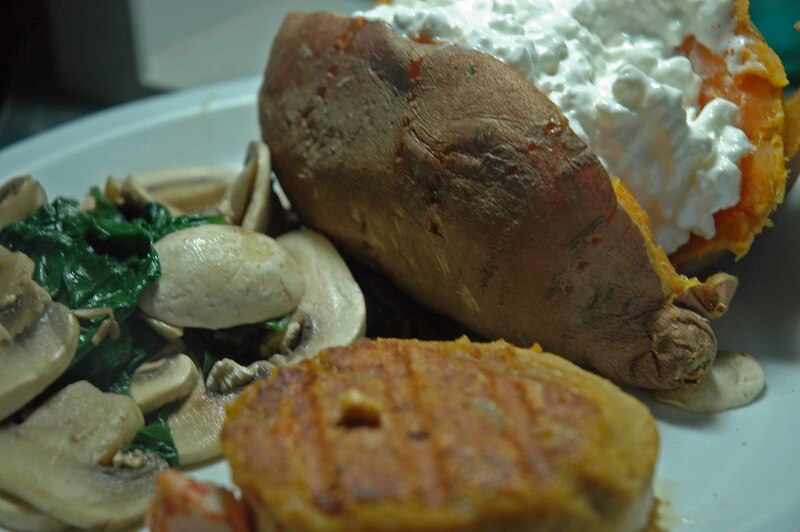 that sweet potato with greek yogurt looks delicious! I usually just eat my sweet potatos savory..I think they taste perfect. but you have tempted me, now. maybe i’ll branch out next time. 🙂 actually, just bought some tzatziki greek yogurt dip from whole foods…I bet that’d be good on a sweet potato!!! and I like meals that are quick to make, because let’s face it. college athletes..we’re kinda pressed for time. and I don’t have a meal plan (our dining hall isn’t that great) so I just eat my own stuff. ughughugh you’re making me want a quiche so, so bad! It depends on my mood how long I am willing to make food for. Recently I’ve been doing pretty quick things because I’ve been nusy but I enjoy finding a recipe and getting excited about it so I don’t mind if it takes a while to make:) I like thunderstorms during the summer because it’s like a built in afternoon nap time:) But I don’t like when thunderstorms come along with tornado warnings and what not, I freak out. I’ve never really eaten at the dining halls at school, but I’ve heard everything tastes similar. Doesn’t sound good…except everyone always comes out carrying soft serve cones! 1. The time I allow myself to cook relies solely on how my day at work went and how hungry I am. 2. I’m not in school anymore but when I was, absolutely not. The salad bar was awful and everything else was greasy pizza, pasta and and other crap food. Oh my goodness. If my school had an awful salad bar, I would legit riot.